Thank you for the nifty little tool. I tested Ding-Press and it worked fine. I tried to add more passwords using the pattern from the INI file but it turned out that the program is set to use only passwords from 0 to 9. The program is set to stay on top. The program is tiny (923 KB executable) and light (it uses about 16 MB of RAM). The program has tray icon but cannot be minimized to tray only (not shown in taskbar). 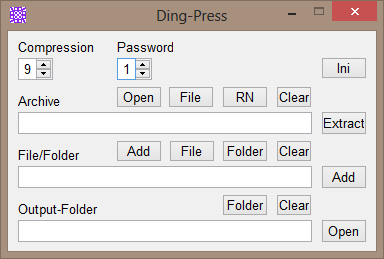 Overall, Ding-Press is a very promising tool. Thanks for sharing it, Ding-A-Ling. It seems that user Ding-A-Ling deleted his post while I was replying to it. I've attempted to expand upon Webfork's idea. It's somewhat naively programmed in AutoIt with absolutely NO WARRANTY. The program — such as it is — is reasonably self-explanatory (ie. I think people will be able to work it out by having a quick play-around). If you're going to try this, you'll need to change the passwords that are already in the ini.txt. The program has buttons for picking files and folders and the input boxes accept the dragging-and-dropping of file- and folder-names. compresses folders and other files using the highest compression-level (not suitable for large folders/files). @smaragdus: Thank you for your interest, positive comments and constructive criticisms. Last edited by Ding-A-Ling on Wed Nov 21, 2018 5:15 am, edited 8 times in total. Well, do you think that it is even good enough to share? If you thought it was, I'd have to consider it. If I released the source code generally, would you vote for the compiled version's inclusion in TPFC's public database? How does licensing work? Is it just a statement in a read-me file? If not, how involved is the process to license one's work? Is it free? To use, say, the MIT licence, would I need to pay for legally recognised copyright first? Could we move this conversation to the forums? So many of these topics come up so frequently, I'd like to answer these in the forums so I can reference this conversation later. No, it doesn't cost anything. A license literally is just attaching a file with some text and your copyright. That affords you real legal protection. If you use a standard license, other people with that same license (who want to protect their work as well) will come to your aid should you end up in court. This has happened many times for many developers of GPL code over the years. As to whether it's good enough, I don't know. The screencap that I saw looked promising. I don't want to say I'll vote for it before I test it. However, if the program works as described and it saves time over the (rather lengthy) command-line process I mentioned in the 7zip command line thread, I will definitely vote for it. Last edited by Ding-A-Ling on Wed Nov 21, 2018 5:14 am, edited 7 times in total. Thanks for both posting that and moving that conversation to the forums. More to come. Update here: so this whole process ran into some difficulty after the Github purchase by Microsoft. My original plan was to get the program posted to Github by way of hosting and some publicity, but now I'm not sure how to proceed. I'm so far underwhelmed by some of the alternatives that I've been exploring. I'm not impressed and I'm really disappointed. I'm being polite (Heaven knows why). At the Github site, the "Read Me.txt" and "License.txt" have been substantively changed without, need I say, my permission. So, vatterspun -- I think we know who that is -- is claiming copyright and ownership. I really should have known better about making the source code available. I'd had my doubts and misgivings and they proved right. I shall not release source code again and be taken advantage of. Fwiw, re Github uploads, by default during the upload process (at least when using the web interface) Github asks you to select a license type and after the repository (the place where the code is hosted) has been created automatically modifies the copyright of the license to the username uploading it initially, unless it was forked from an existing repository which had a license in which case it preserves the original license text. I take it vatterspun is Webfork? Seems like a simple oversight with not having the license file replaced tbh but they can speak for themselves. Releasing something as open source doesn't meant you relinquish copyright. You still own it and it's illegal for someone to claim it as their own. Your copyright has to remain intact. The logic is that your mention in the copyright is the value you get for the work you did. Post an issue to the project with the details of the copyright violation, I'd wager it was an innocent mistake as it appears to be a default MIT license file). You can even file a DMCA takedown on that project on github if you're so inclined. EDIT: It appears that github updated it automatically, which is a pretty poor workflow on their part. Last edited by JohnTHaller on Fri Aug 17, 2018 9:31 am, edited 1 time in total. The license and copyright listing were automatically generated, as Specular suggested. If you look at the home page, the license you posted is listed and was listed that way from the beginning. The license file is now also modified to mirror what was already on the main page. I've somewhat extended my naive Ding-Press. compresses folders and other files. compression-level (1 - 9) (eg. CL6), password (0 - 99) (eg. PW12) and self-extraction (ie. SFX). then password(No) will automatically be used with the decompression. an output folder for compression and decompression (eg. OP"C:\Output"). C:\Portable\Ding-Press\Ding-Press.exe CL7 PW8 SFX OP"C:\Output"
with password8 and with the output going to C:\Output. a GUI window appears displaying a progress-bar. The 7-Zip components have been updated to the latest (19.00) version. As before, passwords are in "plain sight" (unencrypted) in the ini.txt. seemed to be problematic when used with a self-extracting archive. In v1.54, there has been a slight change in the way a directory is archived. As always, this program is ABSOLUTELY WITHOUT WARRANTY. This thread is in the "Portable Freeware Submission" forum after being broken off from its previous place. effort but, if just a few people were to admit to using it, I would add it there.